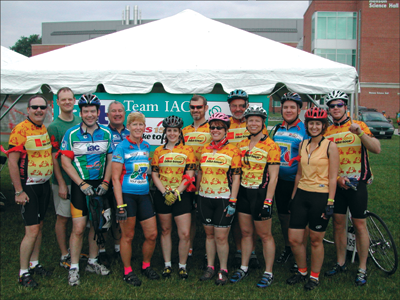 The Industry Advisory Council's 2005 Team IAC, led by Greg Ryan of Robbins-Gioia, raised $14,000 for the MS150 "Tour de Shore" Charity Bike Ride, a two-day, 150 mile bike ride for the Multiple Sclerosis Society, June 11-12 in Salisbury, Md. Contributions are still being accepted at www.actgov.org/MS150. Front row, from left: Robert Scott, Sallie McDonald, Theresa Urban, Marilyn Holland, Colleen Hoar, Janet Dauber. Back row, from left: Greg Ryan, Chris Bishop, Trevor Urban, Ben Gold, Dan Stoltz, Robert Nelson, Craig Schasiepen.